2018 USAS Convention - Blanding, Utah June 8 & 9. Registration form. Save the date. Theme - "Transportation and Movement." Saturday, September 26 at 10 a.m. at the USU Eastern Prehistoric Museum. 155 E. Main St, Price 84501 in the upstairs classroom. If you need directions, please email usasnewsletter@gmail.com. The Southwest Heritage Foundation of Bluff, Utah, is celebrating its recent purchase of an extensive archaeological site located at the base of the iconic landmark Navajo Twins rock formation in Bluff. 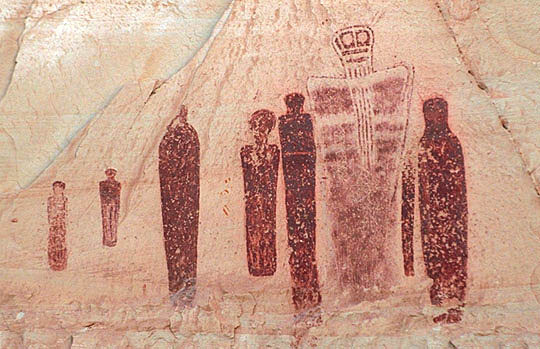 After several years of negotiations and fundraising, the local, nonprofit group is now the steward of a ten acre prehistoric village and an additional five acres of surrounding sandstone cliffs, land formerly held by the Utah School Institutional Trust Lands Administration (SITLA). "This transaction represents the first sale of SITLA-administered lands for the express purpose of preserving a significant archaeological site for scientific research," said Kenneth Wintch, SITLA archaeologist. The purchase is the latest chapter in a process that began 20 years ago when Bluff residents, concerned that the site might be commercially developed, banded together with a vision to preserve the site as open space, as well as for its heritage and geological values, with the eventual goal of making it into an interpretive park. The Navajo Twins I site is one of the earliest and largest settlements along the San Juan River occupied from A.D. 750 to 900, and then again during the Pueblo III era, A.D. 1150 to 1200, according to a report by Bluff archaeologist and SWHF board president, Bill Davis. "Despite its location right in town, the site is well preserved and is a rare and valuable resource for Southwest archaeological research," said Davis. It is also the "type site" for the distinctive Bluff Black-on-red pottery that was widely distributed throughout the Colorado Plateau. "We had an enormous amount of grassroots support," said Davis, adding that there were almost 150 donations, coming from local residents and businesses, visitors to the area and many of the Utah Statewide Archaeological Society chapters. The Grand Canyon Trust, the National Trust for Historic Preservation, and Hank Lewis of DesignBuildBLUFF were also major contributors. Blanding archaeologist Winston Hurst is currently designing interpretive signs that will depict the village as it may have looked 1200 years ago, along with descriptions of how this high desert farming culture survived and thrived, evolving into a complex society that archaeologists still strive to understand. "This site is not much to look at, as ruins go--it's certainly no Cliff Palace or Pueblo Bonito. But it's a tremendously important and interesting archaeological place. It is key to our understanding of the ninth century AD Pueblo people in the San Juan country, and the heart of a wonderful, ancient Puebloan ritual landscape that we're only just beginning to understand. The Bluff people deserve huge praise for their hard work to preserve it, and all of Utah's citizens should be proud of their state government for helping to bring it to pass," said Hurst. In 1994, the Southwest Heritage Foundation purchased the Pueblo II-III era Bluff Great House site on Cemetery Hill from private owners, and for seven seasons, the University of Colorado conducted an archaeological field school, resulting in the recently published book by Dr. Catherine Cameron, "Chaco and After in the Northern San Juan: Excavations at the Bluff Great House" (University of Arizona Press). The Navajo Twins Pueblo I site preserves the record of the inhabitants who lived in Bluff before the Great House was built. "The Navajo Twins Pueblo I site may yield information about the early inhabitants of Bluff, and why the village was abandoned," said Deborah Westfall, curator of collections at Edge of the Cedars State Park Museum in Blanding. "Some may have moved to participate in the emerging Chacoan Phenomenon at the Pueblo II Bluff Great House. Others established homesteads up and down the canyons and mesas surrounding Bluff. Many questions continue to intrigue us: was Bluff a central place? What was the interaction between the Bluff Great House and the surrounding independent homesteads? We continue to explore these questions because they have relevance to our lives today. Why do some people choose village life, and others choose a rural life?" The mission of the Southwest Heritage Foundation (SWHF) is to acquire, preserve and manage archaeological sites and to provide venues for research and public education.